There are problems that can arise between an employee and an employer when filing a workers' compensation claim. The most effective method for dealing with this issue is for both the worker and the employer to honestly evaluate the incident and the injury. If both parties act in good faith toward the other, many problems can be avoided. Typically, an injured worker may face problems faced with an employer based on the legitimacy of their claim. This is why it is so important to have a medical report to support your claim. If an employer acts in bad faith with regard to your claim, you will have a basis for wrongful termination and possibly other legal action. Another problem that often arises is when an employer contacts an employee to question the severity of their injury, or to ask them to return to part time work before they are ready. If you are experiencing difficulty with an employer you should seek an evaluation of your case as soon as possible. Your situation may require legal counsel. Workers' compensation law is designed to protect both the employer and the employee. However, if either party acts in bad faith, either to commit fraud or prevent an injured worker from making a legitimate claim, the law allows for severe penalties and lawsuits. Learn more about employer issues by following the links below. 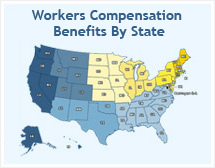 For a free evaluation of your workers' compensation claim, click here. What if my employer doesn't have insurance? What if my employer tells me not to file a claim? Can I sue my employer in court?